When Galileo announced the existence of mountains, craters, and “seas” on the surface of the moon, his announcement came in the form of a book, the Sidereus Nuncius, or Starry Messenger. It included the first printed telescopic images of the moon. This exhibition explores how the face of the moon has been variously depicted in the years since, from Galileo to the Apollo Program. Galileo’s printed observations about the face of the moon in spring of 1610 forever changed our view of the universe. Since antiquity the moon had been considered a "heavenly" object, made of a perfect uniform substance, eternal, immune to change. Galileo saw the moon as a world, made of the same elements as our own planet. He literally brought the heavens down to earth. The consequences of this new view of the moon were several. In the larger sense, it caused the rapid demise of the doctrine that the celestial and terrestrial worlds are separate and irreconcilable realms. But in a smaller way, it also raised a host of new questions about the moon itself. If the moon is a world, what is it like? Can the surface be mapped? How shall we name the surface features? Does the surface change? Where did the craters and maria come from? Why is the lunar surface so different from that of earth? This exhibition is concerned with the smaller set of questions, and with attempts to answer them in the four centuries since Galileo's initial discoveries. It explores how the face of the moon has been variously delineated as telescopes were improved, as the effects of new inventions such as photography were applied, and as space technology brought us to the very surface of the moon. 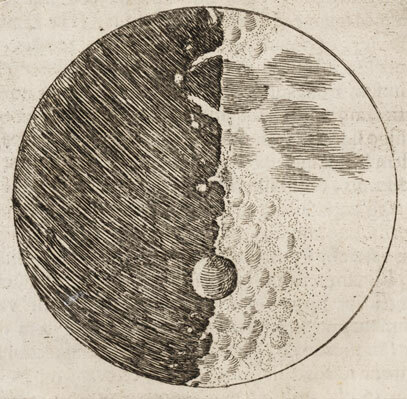 It is remarkable how well the pioneer observers of the seventeenth century were able to see with their unwieldy 100-foot telescopes, and how beautiful their lunar engravings still appear. The detail of the great nineteenth-century visual atlases is also astonishing, and the beauty of the turn-of-the-century photographic atlases, printed in brilliant photogravure or collotype, is absolutely stunning. The splendor of all this selenographic history provides the perfect setting for the fruits of the Apollo decade, with its outpouring of Lunar Orbiter and Ranger photographs, U.S. Air Force and Geological Survey charts, and finally, the Apollo images themselves. The Linda Hall Library is pleased to present this online version of The Face of the Moon.